A One Sky strategic plan serves to guide this organization to achieve its mission statement over a given period of time. This document will guide the organization to make strategic decisions over a three-year period from July 2004 until July 2007. The strategic plan includes a collective unified vision of what the organization is, how it operates and what it actually plans to do. It serves the organization as a nautical chart serves a ship. The document describes not only what each individual campaign and project intends to do but how these activities complement each other in the overall direction the organization is going. Because a growing organization such as One Sky is very dynamic, the plan is meant to guide, not restrict the organization as opportunities and obstacles arise changing the nature of individual activities or campaigns. Despite the inevitable ebb and flow of energy this strategic plan is intended to help us stay on course. We have included a brief history of One Sky and tried to capture our philosophical principles to better understand why this plan has the flavour that it does. This strategic plan is a public document intended to internally guide board, staff and volunteers of One Sky as well as give external funders, donors and interested parties an idea of where we are going and why. It is a collectively written document subject to the review of the staff and volunteers and is sanctioned as an official “plan” by the board of directors who have ultimate authority within One Sky to ratify its contents. It becomes the sounding board for strategic decisions and a guide for judging the relevance of opportunities as they arise. 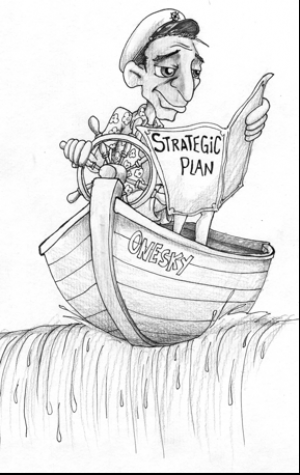 The current One Sky strategic plan can be downloaded as a PDF file under the documents section. The upcoming strategic plan is currently being developed.